Troy Benesch: Learn 3D While Having a Blast! The Washington DC chapter of ACM SIGGRAPH is proud to present Troy Benesch, an award winning animator who is currently the Creative Director and a principal at V! Studios. Troy will be discussing ways to re-imagine the mundane aspects of client projects then turn them into something fun, challenging, and demo reel worthy. We have all worked on projects for clients. While some of these projects can be exciting and “fun”, other projects can leave something to be desired. In either case, it is important to continually increase our skills sets, in order to remain competitive, by learning new techniques, learning new applications, all while staying abreast of the constant technological advances. While this may seem an arduous task, it does not have to be. We can find ways to re-imagine these tasks so they become fun and we can also find ways to get motivated in the process to learn new things while, most importantly, having a blast doing so. If you don’t feel the passion when doing your 3D work, something needs to change. 3D software is just another tool in our artist bag, and sometimes we lose sight of that. 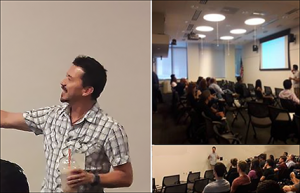 Please join us on Thursday, June 22, 2017 from 7pm to 9pm at the US Patent and Trademark Office as Troy shows some of his recent “fun” personal projects, what inspired them, along with his approaches on handling them and how they were created. Troy Benesch is the Creative Director and a principal at V! Studios, a local Creative Technologies firm founded in 1993. Troy has been involved in animation since high school (pen and paper and 8mm cameras) and has taught at local colleges (Corcoran, etc.) and companies (Apple, etc.). He has garnered numerous industry awards and loves sharing what he has learned over the years through talks and user group meetings. He currently hosts the Cinema 4D/Maya 3D Animation MeetUp. He loves storytelling through his art and strives to improve his skills whenever possible. He has been an Art Director at NASA HQ for the past 11 years and spearheads the commercial accounts at V! Studios.